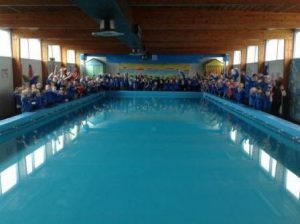 The town’s swimming pool which is located in the school’s grounds and is run by the charity ‘Friends of Hay Swimming Pool’. The pool has been refurbished, new equipment has been purchased and all classes are enjoying weekly swimming lessons led by fully qualified swimming teachers. Local school also use the pool and it can be privately hired on the weekend. Currently bookings can be made via the Facebook page ‘Hay Swimming Pool‘ – please email hayswimmingpool@gmail.com for further information. January 2019 – There will be an increase in current prices – the new charges will be confirmed shortly. Unfortunately the increase is necessary as the cost of running the pool has increased over the last few years and since we re-opened in 2015 the prices have remained the same. February 2019 – There will be a ‘meet and greet’ public meeting where you will be able to come along and meet the trustees of Hay pool and find out what they have done and have planned for the future. April 2019 – The pool is a fantastic local facility. The trustees want everyone that uses it to respect the service it provides and adopt our commitment to maintain the building and pool. The overheads and required updates are substantial! To help with this from April 2019 to qualify to book private swimming sessions you will need to be a member of Friends of Hay Swimming Pool. There will be an annual fee of £5 per member (private bookings can only be made by members and they will be the group leader / responsible adult for that session). More details will be released in the new year and at the meeting in February. April 2019: The trustees are aiming to launch an online booking and payment system via a new website! Again more information about this will be discussed at the public meeting in February. There is an active PTFA at Hay School. The PTFA is set up for parents, teachers and friends of Hay School to organise events and raise money for much needed school resources. Over the last few years the PTFA has bought books, computers and outdoor play equipment. They have helped towards the cost of school trips including an annual whole school visit to the seaside. We are always looking for new members. Please contact the school if you are interested in joining. We always need help for the wide range of fundraising events we put on. Each year these include Harvest Bingo, Christmas Fair, Easter Bingo, Summer Fair. We are already discussing more ideas for the coming year. The school’s PTFA has a Facebook page that is used successfully for communicating about upcoming events. Please search for ‘PTFhAy (Hay School PTFA)‘ and request to join this closed group.